Lake Placid Ubu Ale, a participant in NY Craft Beer Week. State lawmakers this week restored a tax exemption for craft breweries. NEW YORK — Small brewers are celebrating in a big way following news that state lawmakers have restored a tax break for craft breweries, averting a potential beer crisis that brewers claimed could have boosted the sales price of craft beers by up to $1 a draft. Gov. Andrew Cuomo and state legislators reinstated the tax exemption, which had been removed after a state court ruled an exemption from state excise tax was unconstitutional. Without the tax break, brewers said they would be forced to raise brewski prices by up a $1 per draft. The move affects well-known small-scale beer producers like Williamsburg's Brooklyn Brewery, Coney Island's Shmaltz Brewing Company and Chelsea Brewing Company. 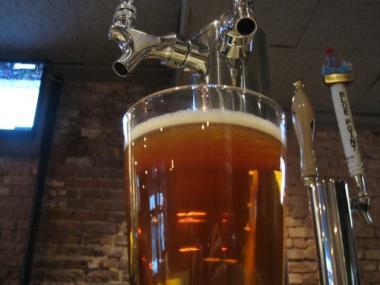 The news of the restored tax break had New York's more than 90 craft breweries "tipping their pints" to state lawmakers, New York Brewers Association President David Katleski said. Restoring the tax exemption helps boost an industry that pumps $200 million in sales into the state's economy and employs 3,000 people, Katleski said. "Gov. Andrew Cuomo and state lawmakers have clearly recognized the contribution the craft brewing industry is making to revive the state's economy, create jobs and demonstrate that New York is indeed 'Open for Business,'" Katleski said. "The deal announced by the governor and legislative leaders gives us the help we need to continue to add jobs and keep prices down for our loyal customers."